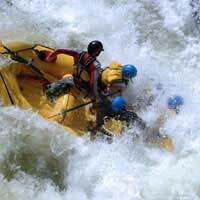 White water rafting offers excitement adventure and a good soaking - just like the rapids on an amusement park ride - only this time the dangers are very real. White water rafting is recreational team activity where a raft is used to navigate powerful and fast-flowing river rapids. The rafts are typically made of very durable, multi-layered rubber or vinyl, hold between 4 and 12 persons and are propelled with regular paddles. Rafting is a popular activity with stag or hen, or business bonding parties. It is a popular with the adventure traveller who wants to see spectacular parts of the globe from an unusual and exciting angle. How Dangerous is White Water Rafting? It is no surprise that an activity which derives its excitement and entertainment from the dangers of the white water is potentially very treacherous, and as such rafting has seen its fair share of injuries and fatalities over the years, on both commercial and particularly private trips. However rafting under the supervision of experienced guides and adhering to the standard safety precautions minimises these risks somewhat. Therefore when considering a whitewater venture is important to consider the equipment and qualifications of the company and guides first before making a splash. In general, like most watersports, rafting has become safer because of innovations in equipment design and increase in expertise. For instance, rivers that were once feared by seasoned rafters are now run safely by novice crews. Rafting is an adventure sport and as such will always carry a certain degree of risk of injury or death, particularly due to white water’s ever present dangers. Although a guide will make every effort to minimise these risks, there is always a chance a participant will fall overboard into the cold, quick flowing and violent waters. Rafters are therefore usually requested to sign an acknowledgement to show they understand the risks, before being allowed to take part. Prerequisites for rafting are that the participants are able to swim, are fit and are aged between 14 and 65. Many centres also have a weight restriction of 17 stone. Those that are physically strong and confident in water will likely take to the activity with the greatest ease. Anyone with asthma, epilepsy, diabetes or a heart condition should consult their doctor before taking part. Rafts should never be manned by anyone who is pregnant or under the influence of alcohol or drugs. White water rafting is a team activity and anyone who ignores such restrictions and warnings will be putting others at risk as well as themselves. All safety procedures and rafting conduct, such as how to sit in the raft and how to paddle, should be covered by the centre that organises the adventure. Those more serious about pursuing the sport further would be advised to get a good grounding by booking an International Rafting Association-recognised level 1 raft guide course. Rafters are all required to wear a helmet and buoyancy aid as well as a long-legged wet suit.